All tents require additional room beyond their size for staking and erection. For a pole style tent 10 to 12 feet should be added to both of the dimensions of a tent to allow for this room. Frame canopies can be installed in smaller areas - sometimes areas not much larger than the tent itself. All tents require anchoring to the ground - in the case of a pole tent for structural support - in the case of a frame canopy so that they are tethered to the ground. Customer must notify us of the location of any underground utilities, septic systems, or irrigation systems. The customer should contact their local utilities to mark off any underground services. If you want to setup a pole tent over pavement we can drill into the pavement to place the stakes. To setup a pole tent over cement the dimensions of the cement should be no larger than the tent itself. Our frame canopies can also be anchored with cement blocks if needed (if you require blocks let us know when you order the tent). We generally install our tents and canopies between the Wednesday & Friday prior to a weekend event. Wedding orders are given priority for Wednesday and Thursday delivery dates to give the customer adequate time to decorate the tent, work out seating arrangements, and have peace of mind that this aspect of the wedding is complete. On some of the busier weeks we will do some installations as early as Tuesday, or as late as Saturday (assuming the event is on Sunday). Monday is the our main removal day, however sometimes it may be done on Sunday or Tuesday due to the weather or scheduling.  Note: The capacity of a tent or canopy will vary with each event’s particular needs. For instance, a 30’ x 60’ tent can seat up to 200 people for a company picnic, but may only accommodate 80 to 90 guests for a typical wedding reception.